A small nation on the road to European integration - Moldova is preparing to switch gears. Seven years after an Association Agreement with the EU, the country is facing an economic crisis, with its pro-European politicians involved in massive corruption scandals and the economy dependent on foreign cash. Now the country's newly elected President is promising a turn to the East - to restore ties with Russia. Will he be able to strike a balance between Russia and Moldova's Western partners? Will the county continue its path to European integration or will it scrap the existing EU pact? 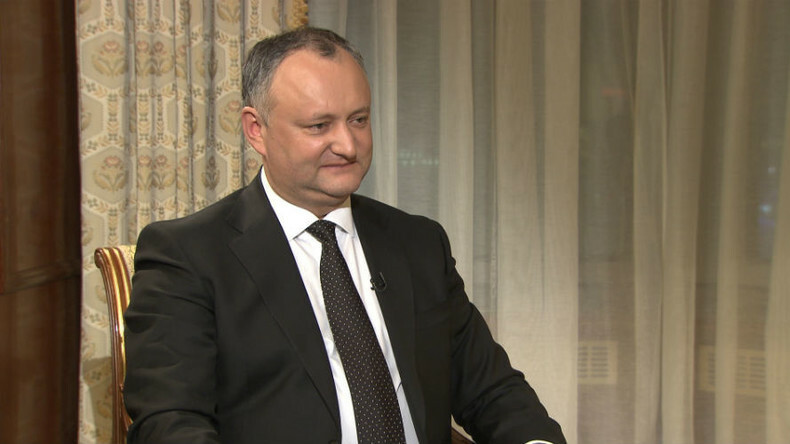 The President of Moldova, Igor Dodon is on SophieCo to talk more. Sophie Shevardnadze: Mr. President, one of the first things you did was remove the EU flag from outside the presidential office. The official website of the President of Moldova used to be in Romanian, and now it’s in Moldovan, though they are quite similar languages. Was this a matter of principle for you? Igor Dodon: I believe it’s very important for high-ranking officials to observe and respect their country’s laws and constitution. The Constitution of Moldova clearly stipulates that the state language is Moldovan, so of course one of the first things we did was make sure the official website was in line. We will continue working in the same direction. I believe it’s not the history of some other state that our children should be studying at school, but the history of Moldova. We aren’t even a member of the EU yet, we are only a part of the Association Agreement. So yes, it’s our belief that the only flag that should be decorating buildings like the presidential office - first and foremost, should be the flag of Moldova. Just a few days after the EU flag was removed, I discussed this issue with several European ambassadors. I also told the EU ambassador in Moldova that having this flag up was bad for the EU itself - an EU flag flying above Moldovan prisons discredits the EU and its symbols. That’s why it’s a matter of principle. SS: You want to have close ties with Moscow, while your Prime Minister advocates European integration. How are you going to balance your relations with Moscow and Brussels? ID: It won’t be easy, of course. But I’m convinced that it’s unacceptable for smaller nations like Moldova to look for partners in the West and to go against the East or vice versa. The problem we’ve had for the last seven years is that our foreign policy has been skewed towards Europe, with a clear anti-Russian message. And has Moldova benefitted from that? Not in the slightest. So what I’m doing now is meant to remedy this imbalance. I am not in favour of damaging our relations with the EU, it’s our neighbour. There will be no new Iron Curtain along the River Prut that separates Moldova and the EU. We don’t want that. We are good partners with the EU, we have an agreement on visa-free travel that’s very important to our citizens. So I’m not against having ties with Europe – I’m just in favour of a strategic partnership with Russia. SS: That sounds very reasonable. In fact, what you’re describing is what many leaders of post-Soviet states, and other states want, but in reality it’s quite challenging. Let’s take the Association Agreement - you say it’s inefficient. But it was ratified by parliament, and according to the constitution you can’t repeal it. So that means you have to implement it, right? SS: Well, you could call for a referendum. ID: That’s a different matter. But if after the next parliamentary elections – there might be early elections this year or scheduled elections in 2018 – there is a different majority that announces it wants to terminate this agreement, I will certainly support that as President. Until then there’s nothing to be done about it. And until then I aim to restore friendly relations and a strategic partnership with Russia. We’ve already made the first step in that direction. I came forward with an initiative to sign a framework memorandum on cooperation with the Eurasian Economic Union. It might provoke some criticism, but it’s non-binding in nature and it’s not at odds with the Association agreement. It creates certain channels for exchanging information. I think that’s good, what’s the problem with that? During our meeting with President Putin, I suggested Moldova could become an observer at the Eurasian Economic Union. It doesn’t mean we’ll be a member – we have an Association Agreement with the EU after all – but we could become an observer, and we’ll be working in that direction. SS: You also want to alter the agreement with the EU to allow Moldova to trade both with the EU and Russia. Where’s the guarantee that Europe will agree to that? The sanctions against Russia are still in place. Do you think the EU will let you trade both with Russia and the EU? ID: I’m going to Brussels in early February and we will be discussing this issue. I don’t rule out the possibility of setting up a trilateral platform – Russia, the EU and Moldova – to negotiate this. I know it won’t be easy, and finding a solution will take a lot of time. That’s why we agreed today to expand our trade in terms of the number of businesses and goods, which doesn’t mean lifting sanctions. Of course, until we agree on something with the EU there can’t be a full-scale return of Moldovan goods to the Russian market. We know that. SS: Have you determined what steps you’re willing to take in order to ensure that Moldovan wine and other goods regain access to the Russian market? ID: I’ll give you a few specific examples. In the last six months of 2016, we exported 60 tons of apples to the EU and imported 1,500 tons. We used to export 200,000 tons of apples to Russia. Whatever goods we take, the picture is the same: after we signed the free-trade agreement with Europe, we’re losing our industries, we’re losing jobs. It’s a serious problem. What do we do? We need to return to the Russian market. How do we do that? We need to negotiate. On my first official visit as President I came to Moscow to do just that, and I hope in a few weeks Moldovan manufacturers will start benefitting from it, because more Moldovan goods will make it to the Russian market. But to find a comprehensive solution we need to negotiate with the EU as well. There is no other way. SS: I’d like to hear your take on some major corruption cases, like when $1bn disappeared from Moldovan banks. There were pro-European ministers involved. Did you find that surprising? ID: It’s not a matter of surprising or not surprising. I was the first to speak to our lawmakers on this, and it was on our party’s initiative that a parliamentary commission was set up to investigate this case. This is one of the reasons people are more sceptical about the EU today. I have already mentioned that in 2009 - 70% of voters were in favour of EU integration, and now this number is only at about 35-40%. Why is that? In the last seven years I have been asked many times by our American and European colleagues the following question: “Mr. Dodon, we don’t really understand, we had 70% of the population’s support and we gave your government 2.5-3bn dollars, and that sum was allocated in different forms - loans, grants and whatnot; we gave you certain political bonuses - the Association Agreement and visa-free travel, but people still don’t like us. Why?”. It’s pretty simple – all I can say to them is that they supported oligarchs. That all the money they gave us just went down the drain. Because ordinary people think that those with European integration banners are in fact just stealing money from Europeans, and they have already stolen more than one billion dollars out of our banking system. Of course the pro-European politicians are losing the public’s trust. And what did our local authorities, oligarchs do? They blackmailed the West in a way by saying that if the EU ceased support for them, if the EU refused to turn a blind eye to all the lawlessness they were involved in, then the socialists would win in early parliamentary elections and that the country would then turn to Moscow for help. That’s how they blackmailed them. But I believe that there’s a new reality on the ground now and that the situation will change soon. SS: You’ve given me the figures of how many people want to now become part of the European Union, but I for one know that there is a whole region of Gagauzia which actively opposes becoming a part of the bloc. How can the parliament drag the country into the EU if there is as a whole region against it? ID: Truth be told, I don’t think we will be part of the EU. A: Brussels and everybody else in Europe admits that this is not going to happen in the following 10 to 15 years. And what will happen to the EU itself in 5 or 6 years? We see a number of politicians from various countries claiming that they are going to quit the union. That is why it is absolutely clear that we will not join the European Union. Everyone in Moldova, and I am sure in Brussels too, understands this. We, on our part, should wake up to the fact that if Moldova decides to become part of the EU one day, there will be no opportunity left for dialogue with Transnistria. And it is most likely that Gagauzia will not follow us into the EU either, because 98% of its population voted in favour of the Eurasian Customs Union at the referendum back in 2014. We are destined to find common ground with Russia. We will not succeed in uniting the country if we do not build a strategic partnership with Russia. If we do not unite the nation, then we are bound to face the risk of losing our statehood – we have Romania right next door, willing to absorb us at any moment. SS: Speaking about Romania, it’s giving its citizenship to Moldovans, luring them over in a way. Both countries have a very strong movement for unification. Does that worry you? ID: As a matter of fact, the majority of those Moldovans who acquired Romanian citizenship, and there are hundreds of thousands of them, did it not because they wanted to be Romanian, but to solve their personal material problems, to go to Europe without a visa and so on. The majority of our citizens stand for the preservation of Moldova’s statehood. As for the position of Romania, they are our friends and neighbours, of course, but it worries us. I have said many times that we want to be friends with Romania, they are our neighbours and we have no problems with them except for one – their attempts to undermine Moldova’s statehood. We will adopt a tough and critical stance on that issue. I believe any party in Moldova calling to be united with Romania should be abolished by law. Our constitution stipulates that such actions should be regarded as anti-constitutional. SS: I’d like to talk more about the issue of European integration. The attempt to integrate Ukraine, for example, lead to a war and political chaos. SS: Both the U.S. and the EU promised to allocate all kinds of aid, if Ukraine took a pro-Western course. Three years have passed and so far they have not received much help. Why do pro-European politicians in Moldova believe that the situation is going to be any different for you? ID: I think that most pro-European politicians fall into the same trap, oligarchs in particular. They hope that they will succeed even though all others failed, that is why they keep going. They won’t succeed anywhere, including in Moldova. Those pro-European parties that have been active in the last seven years - now only one of them is left, that is the Democratic Party. Its rating stands at between 7% and 10%. The ones that formed the majority in the Parliament in 2009 – they are all gone. If early elections happened today the Party of Socialists, which I used to head, and other pro-Moldovan, pro-national parties would take the majority of seats in parliament and maybe even have the constitutional majority. So, it is not a long-term strategy. Early elections this year or regular ones next year will set everything in its place. SS: This association agreement with EU envisaged an increase in exports and investments. In fact, it’s been quite the opposite. Today, the country faces an economic crisis. So, what went wrong? ID: You know, these two years of implementing the Association Agreement resulted in this: We have lost access to the Russian market, which is 50% of our export, in just two-and-a-half years, and the paradox is that our export to the European market has not increased at all. In terms of investments, last year the flow of goods shrunk four times in comparison with previous years. As for corruption, like I said already, one billion was stolen. There are people who boast about having integration, but we have seen for ourselves that it hasn’t brought about any good for the economy and only further damaged our social welfare. Budget-wise, the grants coming from the European Union have been disappearing into thin air, and, again, one billion dollars were stolen. That is why we have to conclude that within the implementation period, Moldova has experienced no positive impact whatsoever. Who’s to be blamed, Moldovan officials or those in Brussels? The responsibility lies on both sides. European officials should not have been turning a blind eye to what was happening, while minding their own geopolitical goals. The support was granted as a means of opposing Russia. And the money was given for the same geopolitical reasons – to keep it all going. It was this policy of indifference which has led to what we have now. I asked officials from Brussels to explain why a teacher in Germany has to pay taxes when the taxes are sent abroad as financial aid in the form of grants. A Moldovan oligarch steals those grants there and then, after that he buys a castle near that German teacher, who lives in some small apartment. He buys the castle with the tax money he has stolen from you. Nothing good will come out of this until the U.S. and EU officials come to understand that they are being used to achieve someone’s geopolitical goals. It is a problem for Moldovans, that’s true, and more and more people here start to understand that. SS: In 2016, the IMF insisted on adopting legislation that would transfer the burden of the stolen billion to Moldova’s national debt. In exchange they promised financial assistance. I know that you want to revoke that policy. ID: It is a peculiar situation. When the billion dollars were stolen from the banks, Moldova had an agreement with the IMF, there was an established partnership. I am convinced that when this money was being taken out, our partners saw it happening. How can a billion just disappear when they were monitoring the situation? But they didn’t say anything. After we raised the issue, the IMF came up with the following condition – if you don’t put this billion on your taxpayers to pay off within 25 years (and with interest they will have to return twice as much, not 13 billion lei, but 25 billion), then you won’t get any of our handouts to cover your ongoing expenses. This is a bad policy. We were strongly opposed to it – the debt of a billion dollars stolen by oligarchs was going to be paid off by regular people. That’s why I proposed revoking this legislation. The IMF strongly disagreed. ID: As the Economics Minister and Deputy Prime Minister, I was the one negotiating with the IMF in 2005… and 2006 till 2009. It was a very good process and we came up with a very good deal. I am not against the IMF. But any deal we strike with the organisation has to be protective of our national interests. Back then we were able to do it. But the guys who are involved in this now lick the boots of Western donors, because they live on their grants and stipends. Of course, they want another handout. This would turn us into a banana republic, hooked on Western money, unable to survive without it and lacking the wisdom to build our own economy. We don’t want to live from one financial injection to another. SS:Right, so what is going to happen? The IMF has offered you 179 mn dollars in aid. We understand that this kind of help would require Moldova to implement austerity measures. It didn’t work for Greece, it is not working for Ukraine. Why does anybody think that this scenario would work for Moldova? ID: Because they don’t think about the long-term prospects. They think about surviving the next month, month and a half. And they have no idea how to do it without another handout. By the way, 30% of our revenue in the 2017 state budget comes from an international grant. Can you imagine? Our economy has reached a point where we can’t feed ourselves and a third of our budget is handouts from Western banks and organisations. If we keep moving in this direction, not paying attention to our economy, to building good relations with Russia, then this 30% will turn into 50%. And then what? We will just listen to what Uncle Sam says? So I strongly disagree with this approach. We need to develop our own economy. But it is impossible to build the economy and create jobs without partnering with Russia. SS: But how are you going to keep this and other campaign promises, when your own cabinet disagrees with your ideas? ID: First of all – it’s not my cabinet. This cabinet represents the parliamentary majority. But it’s not like they have that much room for movement. Of course, they don’t have to agree with all our proposals, but if they refuse to work with us supporting our initiatives, we will have no choice but to initiate a constitutional reform allowing the president to dissolve the parliament. I have voiced this before. If in the following weeks or months the cabinet refuses to support our proposals, we will put forward this initiative. And the people will support us, because right now the majority trusts the president, not the cabinet. About 85% of our citizens disapprove of the cabinet. So if they want this confrontation, fine – let’s go ask the people, hold a referendum, change the constitution. But it won’t benefit them. They have to accept our proposals – there is no way around it. SS: Belarus, for example, agreed to help the EU by accepting refugees. In exchange they want some European visa restrictions removed. Would you be open to the idea of accepting refugees from North Africa for example, for the sake of better visa agreements with the EU? ID: Definitely not! I am strongly opposed to the idea of refugees coming to Moldova. The majority of our people agree with me on this issue. We will block any such attempts. SS: Let’s talk a little bit about NATO. The Moldovan Prime Minister signed an agreement with NATO to open a liaison office in Chisinau. NATO speaks about its wish to cooperate with Moldova, but NATO is a military organisation, while Moldova is a neutral country. What kind of cooperation are we talking about then? ID: I believe that these are attempts to make us – in the future, perhaps – join some military alliances. It is no coincidence that this was signed before I took office. I assumed office on December 23, last year – and they had signed this agreement in early December, because they realised that I would try to stop it. Certainly, I will be working to overturn this decision. In early February, when I am in Brussels, we will have a meeting with NATO leaders – we’ve already made a formal request. I want to know if they are ready to once again publicly support and sign the agreement, which would recognise the neutrality of the Republic of Moldova. Because if they are not – we need to understand what to expect from them in the future. SS: NATO’s Secretary-General, for example, said that a liaison office will help NATO to support reforms in Moldova. It’s as if Moldova is unable to implement reforms without NATO’s assistance? ID: We are totally against this and we will continue to block these attempts. SS: I had a talk with the President of Serbia, and it seems that NATO is carrying out a PR campaign in Serbia and Montenegro in order to improve its image. Do you think they may be using the same strategy in your country? ID: We have seen some attempts at this before. On Victory Day last year, they tried to organise a NATO military parade on the central square. On May 9, on Victory Day, fully realising that it is a holiday for us. This was a provocation. And after we mobilised the public, blocked NATO military vehicles on the border and warned them that we will carry their vehicles out of the country with our bare hands if we have to – only then did they back down and leave. Of course, there is some NATO propaganda in our country, but the majority of Moldovans are totally opposed to the idea of joining NATO. That is why, in the foreseeable future, I don’t believe there is a chance something will change. But it doesn’t mean that now is the time to relax, not by a long shot. So we are going to block all these attempts, like creating a liaison office and so on. We are going to oppose all the suspicious joint military exercises – what is the point in them? Who is Moldova going to war with? Why are there American tanks in Chisinau? I mean it’s clear they are not there because of Syria. What we do have close to us is Transnistria and Russia. So it’s very dangerous for us to play this kind of game. There may have been people – before Trump – who thought they would benefit from creating a new point of conflict in Moldova and then dragging its partners and – obviously – Russia into a local conflict of some kind. We don’t want this. I don’t want our country, our citizens to become cannon fodder. SS: You mentioned Transnistria, where the conflict is still in a “frozen” state. You said that you are ready for dialogue. What can your country offer Transnistria and vice-versa? ID: At the start of this year, on January 4, there was a meeting between the leaders of Moldova and Transnistria – for the first time in 9 years. For 9 whole years nobody wanted to even talk to the leadership of the Left Bank. I made a visit to Transnistria to meet their new leader, Mr. Krasnoselsky. We had a very good talk about the current situation and the ways to move forward. We identified the problems we need to solve, so I believe we have a window of opportunity here. We have outlined a roadmap for the next few months. I hope that in late February or early March we will have a new meeting, during which we’ll be trying to solve the problems of people who are living on both sides of the Dniester river. So far, as I understand it, our friends and partners are not ready to talk about political status. But let us begin by solving the problems of our citizens. We have agreed on taking these steps in order to move forward. I have discussed these issues with Vladimir Putin during my official visit to Russia. We reached a mutual understanding and I believe that in the next 2 to 3 years we will have a real opportunity to make progress and solve this problem. SS: Thank you for this interview, Mr. President, and good luck with everything. ID: Thank you very much.